or violet coating. After the United States entered the war, the candies were exclusively sold to the military, enabling the heat-resistant and easy-to-transport chocolate to be included in American soldiers’ rations. The company’s longest-lasting slogan reflects this: “Melts in your mouth, not in your hand.” By the time the war was over and GIs returned home, they were hooked. 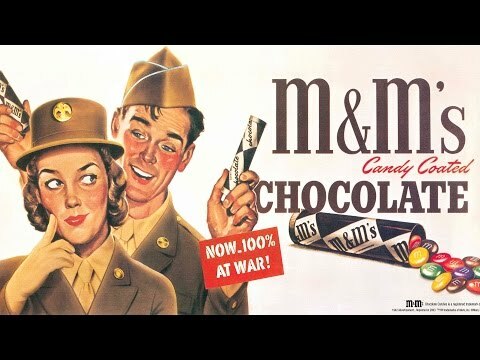 Shortly after wartime quotas ended and the candies were made available to the general public, Forrest Mars bought out Murrie’s shares in the company and took sole ownership of the M&M brand. The familiar brown bag package that remains in use today was introduced in 1948. In 1950, the candies were imprinted with a black “m” (which changed to white in 1954) and customers were encouraged to “Look for the M on every piece” to ensure they were getting the real thing. Peanut M&M’s made their debut in 1954, along with the cartoon characters Mr. Plain and Mr. Peanut, and by 1956 M&M’s had become the No. 1 candy in the United States.